This book examines the existing constitutional and legal system in England, Wales and Scotland, through the prism of its treatment of religion and belief. The study encompasses questions of Church/state relations, but pushes far beyond these. It asks whether the approach to religion which has spread out from establishment to permeate the whole legal framework is a cause of concern or celebration in relation to individual and collective freedoms. The primary focus of the work is the synergy between the religious dimension of the juridical system and the fundamental pillars of the Constitution (parliamentary sovereignty, the rule of law, separation of powers and human rights). 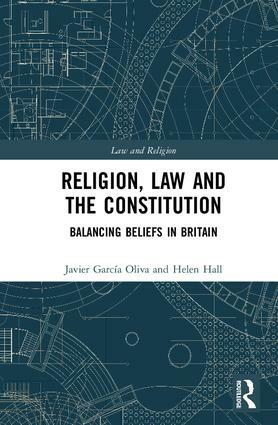 Javier García Oliva and Helen Hall challenge the view that separation between public and religious authorities is the most conducive means of nurturing a free and democratic society in modern Britain. The authors explore whether, counter-intuitively for some, the religious dynamic to the legal system actually operates to safeguard liberties, and has a role in generating an inclusive and adaptable backdrop for our collective life. They suggest that the present paradigm brings benefits for citizens of all shades of religious belief and opinion (including Atheist and Humanist perspectives), as well as secondary advantages for those with profound beliefs on non-religious matters, such as pacifism and veganism. In support of their contentions, García Oliva and Hall examine how the religious dimension of the legal framework operates to further essential constitutional principles in diverse settings, ranging from criminal to family law. In a groundbreaking move, the authors also set the legal discussion alongside its social and cultural context. They consider how the theological perspectives of the larger faith traditions might influence members’ ideas around the key constitutional precepts, and they include extracts from interviews which give the personal perspective of more than 100 individuals on contemporary issues of law and religious freedom. These voices are drawn from a range of fields and positions on faith. While the authors are at pains to stress that these sections do not support or advance their legal or theological conclusions, they do provide readers with a human backdrop to the discussion, and demonstrate its crucial importance in twenty-first century Britain. 1. Church/state relations and their historical evolution: whale knees or penguin wings? 2. Religion in the current paradigm: the flight of the penguin? Dr Javier García Oliva, Senior Lecturer in Law, University of Manchester. Dr Helen Hall, Lecturer in Law, Nottingham Trent University.